Oduman hookahs, most known for their modern style glass hookahs, have released their first traditional style hookah design! The Gusto 35 sits at approximately 15" tall and is a fanstastic table or desktop hookah. The stem is made of high quality stainless steel which will be resistant to flavor ghosting and corrosion with the proper maintenance. This easy to clean hookah makes it simple to always have a fresh hookah tobacco session every time. For added freshness, the Gusto 35 includes a washable hookah hose that can easily be cleaned to get all those pesky flavors from your last session out of your hose. 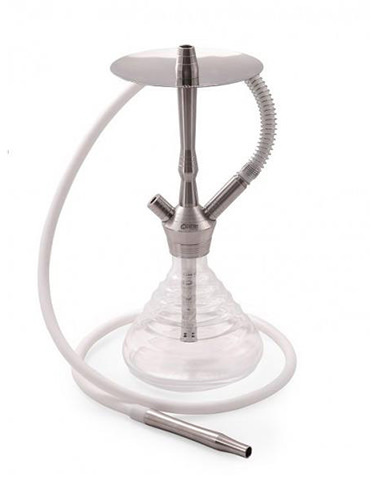 The traditional style hose port on this hookah means that you can use just about any hookah hose with the right hose grommet on this hookah. The Gusto 35 stem comes equipped with a built in diffuser to keep the classic hookah "rumble" to a minimum. If you've ever been annoyed that a hookah bubbling is getting in the way of your favorite TV show or work flow, then worry no more! This diffuser can also be removed with just a couple of twists. Oduman Gusto 35 Glass Hookah has a average rating of 0 stars out of 5 stars based on 0 reviews.